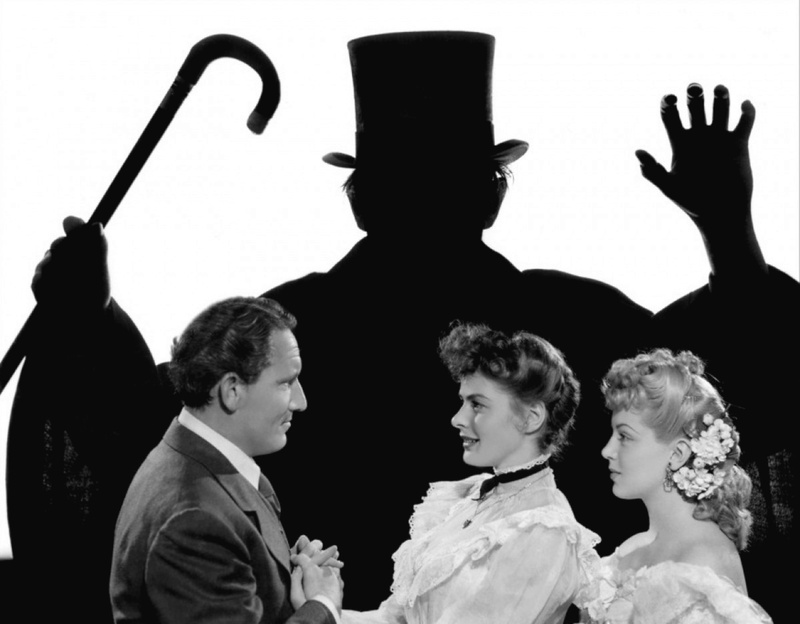 Dr. Jekyll and Mr. Hyde (1941), starring Spencer Tracy, Ingrid Bergman, and Lana Turner, is one of the classic movies airing on TCM this week. This week, TCM is airing great movies from stars like Rita Hayworth, Paul Muni, and Glenda Farrell. Plus, they are putting the spotlight on fictional presidents in movies and the Jaws series. So, without further ado, let's jump right in to this week's offerings. Just a note: the highlighted text has links to full length articles. 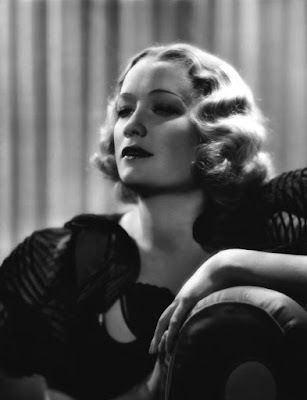 Birthday tributes: Rita Hayworth on Monday and Miriam Hopkins on Tuesday. Sunday Prime Time: Two of Hammer Film Production's Frankenstein movies starring Peter Cushing. Silent Sunday Nights: The Swedish horror film The Phantom Carriage (1922) at midnight is about a menacing omen of death that haunts one man (Victor Sjostrom). This film, which heavily influenced Ingmar Bergman, is renowned for its groundbreaking special effects. TCM Imports: Epidemic (1987) at 2 a.m. Sunday night/Monday morning. Danish director Lars von Trier's horror film is about a director (von Trier) and writer (Niels Vorsel) who find their film script about a modern-day epidemic playing out in real life. Best Day to DVR: Friday night. 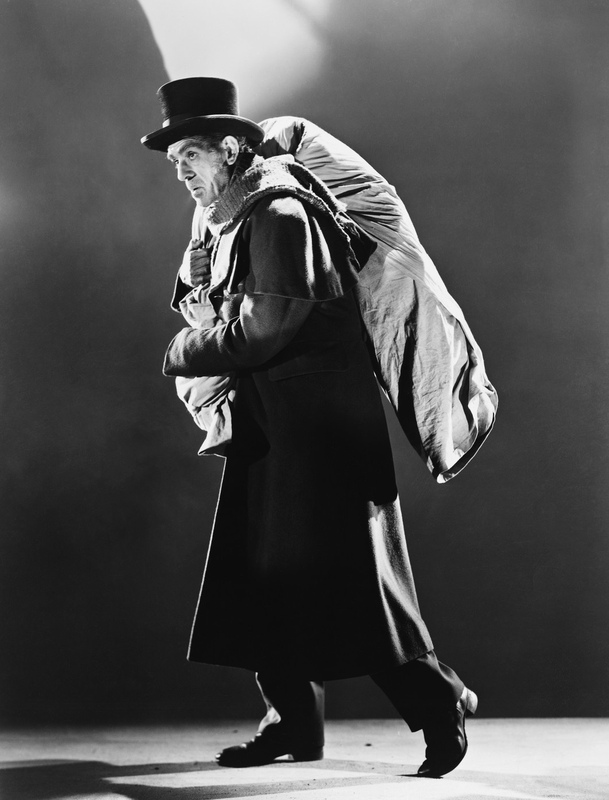 TCM has a great line-up of mad scientist movies, including the 1941 version of Dr. Jekyll and Mr. Hyde, the creepy French horror film, Eyes Without a Face, and producer Val Lewton's The Body Snatcher (1945). 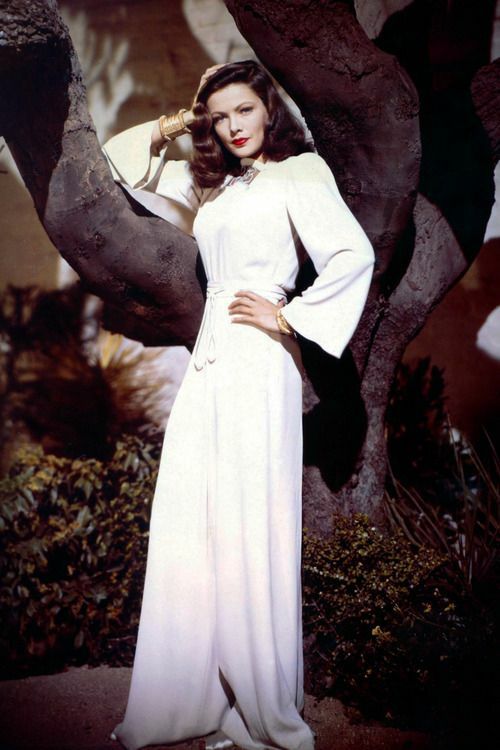 Three daytime picks: The morning theme is a birthday tribute to Rita Hayworth, who was born Margarita Cansino on Oct. 17, 1918, in Brooklyn. Hayworth became one of the top stars of the 1940s in films like the rom-com The Strawberry Blonde (1941) at 9:45 a.m. in which she plays a gold-digger who comes between James Cagney and Olivia de Havilland. One of Hayworth's best roles was in the noir The Lady from Shanghai (1948) at 11:45 a.m., which was directed by her second husband, Orson Welles. The afternoon is devoted to star of the month Christopher Lee's non-horror roles, such as the science fiction shocker She (1965) at 6 p.m., which finds Lee as a priest devoted to a goddess played by Ursula Andress. Prime time lineup: The Lee movies continue with a lineup of B horror movies starting with Horror Hotel (1966) at 8 p.m. about a group of satanists in a small Massachussetts town. Horror Express (1972) at 9:30 p.m. is a loose remake of The Thing From Another World (1951) that stars Lee and Peter Cushing as two scientists who get mixed up with a frozen prehistoric man. Late night pick: Lee is joined by fellow horror legend Vincent Price for the Victorian chiller, The Oblong Box (1969) at 3 a.m.
Three daytime picks: A birthday tribute to Miriam Hopkins, who was born Ellen Miriam Hopkins on Oct. 18, 1902, in Savannah, Ga. Hopkins was one of the great thirties stars in movies like Wise Girl (1937) at 10:15 a.m., a romantic comedy that finds Hopkins as a rich girl who is pretending to be penniless so she can spy on a Greenwich Village artist (Ray Milland). Hopkins famous feud with Bette Davis played out in films like Old Acquaintance (1943) at 11:30 a.m., which features a memorable confrontation scene between the two actresses. Hopkins plays the music hall singer, Ivy, in the Fredric March version of Dr. Jekyll and Mr. Hyde (1931) at 6:15 p.m.
Prime time lineup: Each Tuesday and Thursday in October, TCM is turning the spotlight on trailblazing women in Hollywood. Tuesday's selections focus on actresses who broke down racial and ethnic barriers starting with Hattie McDaniel, who is represented by the melodrama In This Our Life (1942) at 8 p.m. McDaniel was the first African-American to receive an Academy Award. Hispanic actress Rita Moreno, who is represented by the musical West Side Story (1961) at 9:45 p.m., won an Oscar for her performance in that film. Late night pick: Anna May Wong, who is represented by the silent film Piccadilly (1929) at 12:30 a.m., was a top Hollywood star during a time when Asian roles routinely went to European actors. Three daytime picks: The theme is femmes fatale starting with Gene Tierney as a woman whose obsessive love reaches beyond the grave in Leave Her to Heaven (1945) at 6 a.m. One of old Hollywood's most memorable bad girls is Ann Savage in director Edgar G. Ulmer's low-budget masterpiece Detour (1945) at 3:15 p.m. Joan Bennett memorably played several femmes fatale in movies like The Woman on the Beach (1947) at 4:30 p.m.
Prime time lineup: The prime time lineup is devoted to two movies about Presidential politics starring all-American actor Henry Fonda. In Fail Safe (1964) at 8 p.m. Fonda's commander in chief tries to avert a nuclear disaster while in Advise & Consent (1962) at 10 p.m., he is a controversial nominee for secretary of state. Late Night Pick: Gabriel Over the White House (1933) at 2:45 a.m. finds Walter Huston as a corrupt president who becomes an ardent populist after a near-death experience. This movie was hugely controversial upon its release for its seeming promotion of a dictatorship to relieve the Great Depression. 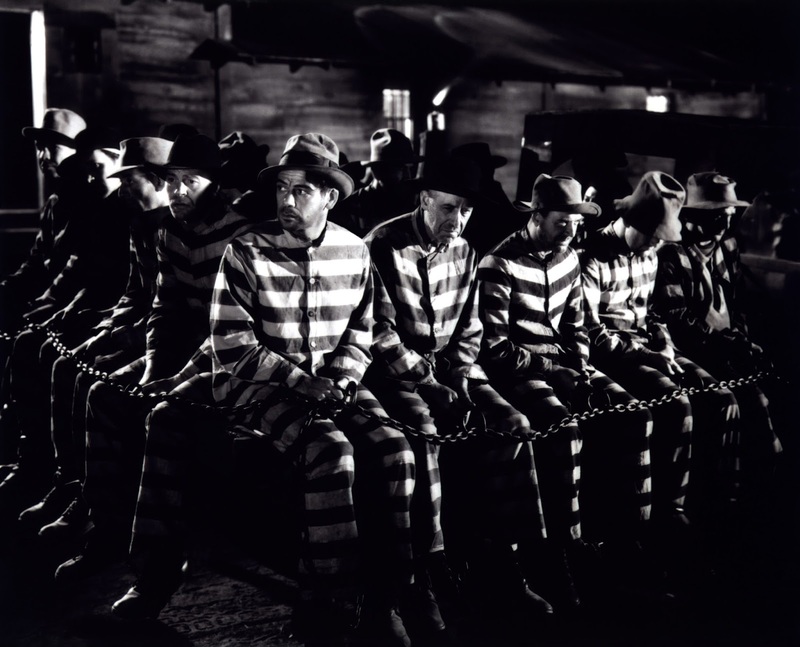 Paul Muni (center) in I Am a Fugitive from a Chain Gang (1932). 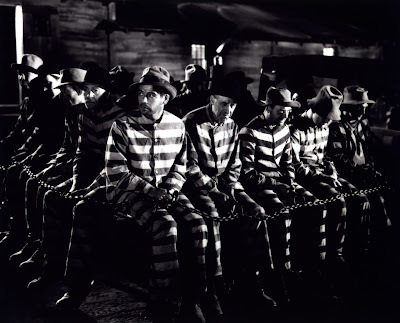 Three daytime picks: The theme is movies starring Paul Muni starting with his searing performance in Warner Bros. socially conscious drama about a Southern prison camp, I Am a Fugitive from a Chain Gang (1932) at 6:15 a.m. Muni won a best actor Oscar for playing the legendary germ-hunting scientist in The Story of Louis Pasteur (1937) at 12:15 p.m. Angel on My Shoulder (1946) at 3:45 p.m. is an intriguing fantasy film in which Muni plays both a gangster and a judge who beat the devil (memorably portrayed by the always great Claude Rains). Primetime lineup: The spotlight on trailblazing women continues with a look at ladies who served in politics and/or government. starting with Shirley Temple, who is represented by Bright Eyes (1934) at 8 p.m. The former child star served as the U.S. ambassador to both Ghana and Czechoslovakia. Jane Alexander, who is represented by the biopic The Great White Hope (1970) at 9:30 p.m., is a former chair of the National Endowment for the Arts. Late Night Pick: First Lady Nancy Reagan is represented by Hellcats of the Navy (1957) at 2 a.m., which co-stars her husband, Ronald Reagan. Three daytime picks: The morning theme is movies starring Gilbert Roland like the prison escape adventure Isle of Missing Men (1942) at 8 a.m. The afternoon features Glenda Farrell as ace reporter Torchy Blane in the popular mystery series. starting with Torchy Runs for Mayor (1939) at 12:15 p.m. and ending with Fly Away Baby (1937) at 5:15 p.m.
Prime time lineup: TCM is showing classic horror films each Friday in October. This week's selections are movies about mad scientists starting with the Spencer Tracy version of Dr. Jekyll and Mr. Hyde (1941) at 8 p.m. followed by the creepy European horror film Eyes Without a Face (1959) at 10 p.m. about a doctor (Pierre Brasseur) who kills women in order to restore his beloved daughter's looks. Late night pick: Boris Karloff plays an 1830's Scottish grave robber in producer Val Lewton's creeper, The Body Snatcher (1945) at 11:45 p.m. The mad scientists continue on Saturday morning with Baruch Lumet creating giant bugs in the B movie The Killer Shrews (1959) at 6:45 a.m. followed by Bela Lugosi unleashing a band of winged killers in The Devil Bat (1940) at 8 a.m. The prime time line up is all about Jaws, featuring three movies about the great white shark that stalks Amity Island. The original Jaws (1975) is on at 8 p.m., Jaws 2 (1978) is on at 10:15 p.m., and Jaws 3 (1982) is on at 12:15 a.m. The Sunday Night Feature will put the spotlight on Frankenstein's monster each week in October. This week selections are two Hammer horror films starring Peter Cushing: Frankenstein Created Woman (1967) at 8 p.m. finds Susan Denberg as a female monster, and Frankenstein Must Be Destroyed (1970) at 10 p.m. finds the bad doctor performing a brain transplant on Freddie Jones.